Higher Capacity Machine – Greater cabinet depth and no insulation requirements allow for deeper spirals increasing capacity, requiring less visits and consequently reducing operational costs. 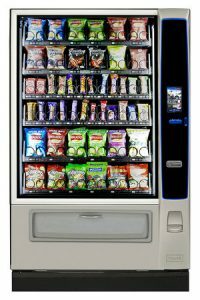 Low Maintenance – There are no requirements to maintain clean or service fridge units reduces the cost of upkeep and increases reliability of the vending machine. Energy Efficient – With no refrigeration the power consumption of the Merchant Ambient has an average reduction of 72% compared to similar refrigerated models. Improved Disabled Accessibility – The Merchant Ambient is fitted with Crane’s tried and tested American Disabilities Act compliant vend bin. Making product collection easier for all and exceeding any EU or UK guidelines.